I have always been fascinated with using wine for cooking but have never had a chance to try it. Most likely it stems from being afraid to cook something that’ll be inedible. Though the only time that happened was a pancit canton fiasco that me and Van ate a bowlful each of. But that’s another story that will never see the light of day. LOL! Okay, back to the recipe. With only red wine and pasta to go with, I had to just make the rest up along the way. The result was one darn good pasta, if I say so myself! 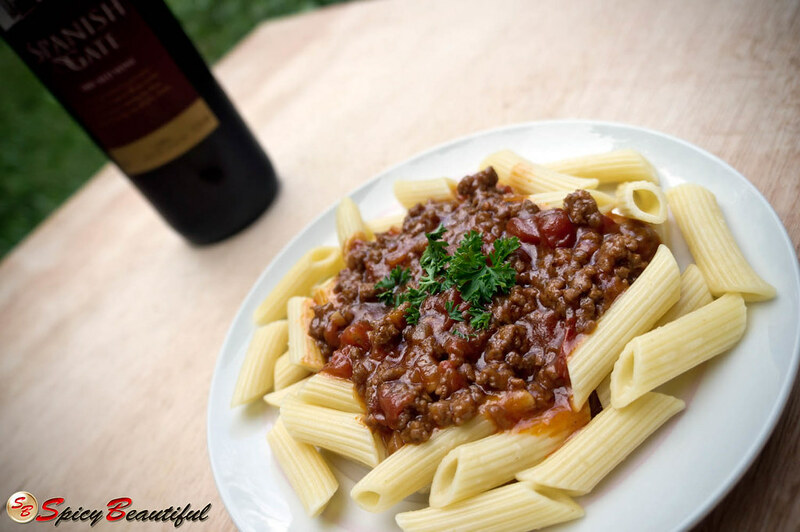 The dry red wine added depth and complex layer of flavors to the meat sauce that worked perfectly with the penne pasta. 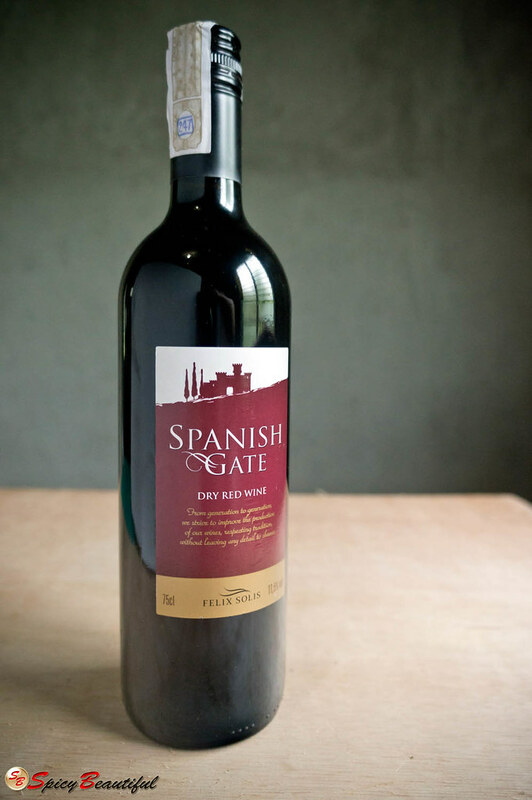 But enough self-flattery and adulation… Try it and taste for yourself! 1. Cook penne pasta according to package directions. 2. Heat oil in a large pan. Sauté garlic until golden brown. Add the onion and bell pepper and cook until the onions become translucent. 3. Add the ground meat and stir fry for 3-5 minutes until the meat is brown then pour in soy sauce. Cook for another 3 minutes or so. 4. Stir in the tomato sauce and diced tomato and bring to a boil. Add the beef bouillon cube and simmer for 2-3 minutes. 5. Add in the red wine, grated cheese, black pepper and cayenne pepper. Mix well and simmer for 15-20 minutes. 6. Stir in the basil leaves and Italian seasoning. Simmer for another 2-3 minutes and adjust the taste with salt. When satisfied, remove from heat. 7. Pour sauce on top of cooked penne pasta and garnish with parsley. 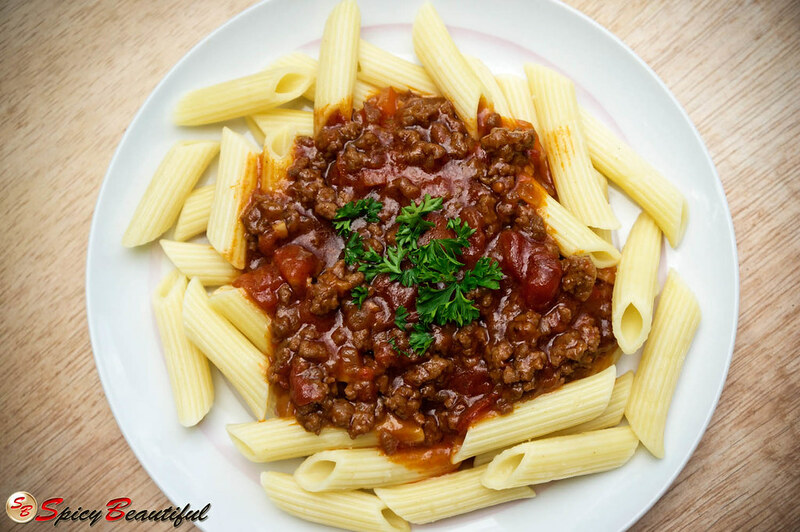 As with the spaghetti, for a party style serving, mix the cooked pasta and sauce in the pan where the sauce was cooked and transfer to a large serving dish.